– The nuclide selector box is now a single drop-down menu. On entering the first letter of the nuclide of interest a list of all nuclides with this first letter is shown. Thereafter, the desired nuclide can be selected or a second letter can be inserted to further refine the search, etc. This is a more efficient procedure for nuclide navigation. 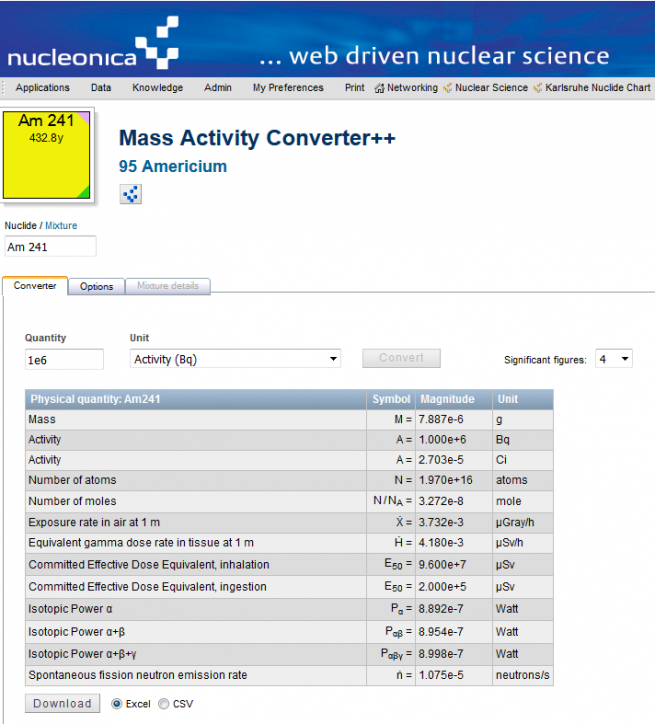 The previous approach was based on two drop-down menus – one for the element and one for the isotope. – Clicking on the small icon adjacent to the nuclide box icon (top left of page) will activate a pop-up menu showing the position of the nuclide and its daughters in the nuclide chart (Nuclide Explorer++). This is of interest to see and highlight the nuclide and any daughters in the chart. – Internally the code has been significantly streamlined and simplified. When the application is loaded all relevant nuclide data are available in the client browser. When calculationds for a different nuclide are required, no further calls to the server are required.